has launched, and we hope you're are as excited as we are about everything it offers. Today we'd like to dive a little deeper into what the Analytics 360 Suite means for the Analytics 360 product specifically. 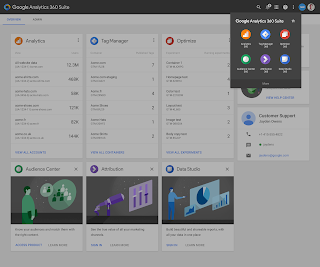 For those who missed it, Analytics 360 is the new name for Google Analytics Premium, and it's now part of the larger Google Analytics 360 Suite. There are no immediate changes that will impact your use of the product, but a new look and feel consistent with the Google Analytics 360 Suite user experience will roll out in the coming months. Analytics 360 is the measurement foundation for the Google Analytics 360 Suite, so we're actively investing in deepening its functionality. In particular, we're continuing to build out its capacity to understand the customer journey, deliver intelligent insights, and help you deeply understand your customers and your business. We also want to help you take action on what you learn. Analytics 360 can be used on its own and will continue to provide all the functionality that our users know and love today. But it can now also be used with the other 360 Suite products that are available for purchase. Let us give you an example of how Analytics 360 and our other 360 Suite products can work together. Say you find a high-performing segment in Analytics 360 — such as customers who spend 50% more than average. As a marketer, you naturally want to cultivate this audience and find more people like them. Now you can share this segment with Audience Center 360, our data management platform, to learn even more about these customers (e.g. demographics) using 3rd-party and Google data. Then you can build new audiences with the same characteristics and reach them with programmatic ads via DoubleClick Bid Manager and other 3rd-party DSPs. Now that you're serving tailored, relevant ads to attract this audience, you want to give them the same tailored experience while they’re browsing your site. So you share the same high-performing segment you found in Analytics 360 with Optimize 360, our testing and personalization tool, to deploy personalized content and site experiences that are a perfect fit for those users. For many advertisers this campaign would be just one of many advertising campaigns marketing is running. Fortunately, because all your performance data flows into Attribution 360, our marketing attribution solution, you can evaluate how the campaign aimed at your high-performing segment is performing relative to all your other marketing. With this broad context, you can optimize your marketing across the board and focus on areas of biggest impact. With all these insights in hand, you're ready to present a business case to your boss for the material marketing changes you’re recommending. That’s where Data Studio 360, our new data visualization tool, plays an important role. It integrates with data from the 360 Suite products and other sources to help you quickly create beautiful stories and bring to life your strategic recommendations. Plus, it integrates seamlessly with Google Drive, so it continues to up-level workplace productivity, team sharing and collaboration. As you can see, the customer understanding you gain with Analytics 360 becomes the starting point for sharing insights across your organization and building a more engaging experience for customers. Using Analytics 360 in conjunction with the other 360 Suite products helps you make your analytics insights more impactful to your business. We’ll be highlighting each of our 360 Suite products in the upcoming weeks. If you’d like to learn more about Analytics 360 specifically, please check out our new solution sheet. 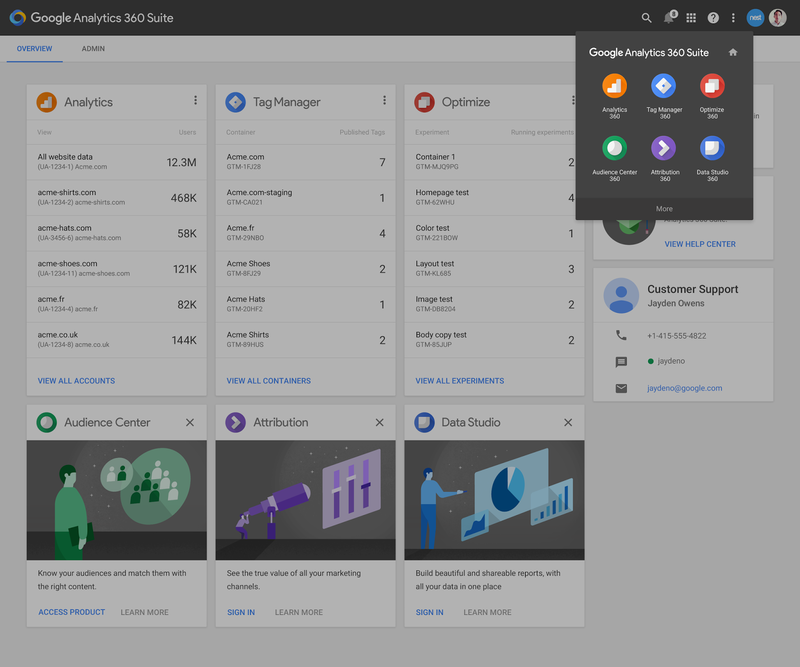 The Google Analytics 360 Suite has launched, and we hope you're are as excited as we are about everything it offers. Today we'd like to dive a little deeper into what the Analytics 360 Suite means for the Analytics 360 product specifically. revealed how successful marketers are able to leverage analytics tools effectively so they make the most of consumer interactions. • Marketers must be able to tie performance to business results. Among the survey respondents identified as "sophisticated marketers," 53% stated they adhere to well-established metrics that tie directly to business objectives. These marketers support organizations that are at least 3X more likely to hit their goals than other marketing organizations. • The right tools are critical to success. Only 26% of marketers surveyed believed that their marketing analytics tools are well-integrated and work seamlessly together. But, marketers with well-integrated tools were more likely to outperform revenue goals. • Marketers that implement complete marketing analytics platforms see an increase in performance. Sophisticated marketers who deploy a complete marketing analytics stack of five or more tools are 39% more likely to see improvement in the overall performance of their marketing programs. To learn more about improving marketing performance with analytics, check out the full study, "Discover How Marketing Analytics Increases Business Performance." Marketers have an increasingly complicated job, with access to an unprecedented amount of customer insights and analytics tools. A new study from Forrester Consulting uncovers how successful organizations use marketing analytics tools to develop relevant customer experiences. Consumers expect to find what they want anytime, anywhere from their smartphones, tablets, and laptop. These micro-moments offer marketers more opportunities than ever before to connect and engage. They also enable marketers to learn valuable insights about consumer behavior. With so much customer data to consider, effective marketing measurement is more important than ever before. To understand the challenges marketers face in measuring performance and creating a well-integrated tool set, Google commissioned Forrester Consulting to perform an in-depth survey of 150 marketing, analytics, and information technology executives. The research revealed how successful marketers are able to leverage analytics tools effectively so they make the most of consumer interactions. For a special holiday campaign, L'Oreal Canada wanted to build a special audience: the best potential customers for their artisinal Japanese brand Shu Uemura. Using the Google Analytics 360 Suite, the L'Oreal team built an audience of people who had interests often shared with makeup users -- yoga, for instance, and certain types of travel. They used DoubleClick ads to bring these similar people to the Shu Uemura website and convert them into customers. The results were game-changing: 2X the expected sales and a return on ad spend of 2200%. Now the L'Oreal Canada team is sharing what they've learned with all of L'Oreal's global brands. If those kinds of numbers sound good, watch the video for more details. “The challenge with television is that there’s no link to click on,” says Alex Bain, Marketing Analyst for Nest. The company makes products for the thoughtful home, but was having a hard time understanding the effect of its TV ads on digital visits and sales. That's why the Nest marketing team turned to the Google Analytics 360 Suite while running a set of six TV ads last holiday season. The suite's TV attribution features are designed to measure the impact of ads on search activity and website visits. As a result, Nest could see the channels and times of day where its ads had the most impact. The metrics arrive almost immediately, so the Nest team found itself spending less time trying to get answers and more time taking action on what they learned. The good results that Nest is getting are available to anyone. Watch the video for more details. What if improved analytics showed you a sales opportunity that you didn't even know you were missing? As you'll see in this video, that's one of the things Progressive Insurance learned from using Google Analytics 360 Suite. The Progressive team discovered that their mobile app visitors wanted more than just helpful insurance quotes; they wanted to buy on the spot. The company responded by improving the customer experience and giving them exactly what they want — the option to buy insurance. The results have been more than satisfactory. “We sell insurance, but if you think about it, our product is actually data,” says Pawan Divakarla, Progressive's Data & Analytics Business Leader. “Organizing data is crucial for us.” Perhaps your own company is finding that data management is becoming more important to success in today's multi-screen world? If so, watch the video for more of the Progressive story. To learn more about the Analytics 360 Suite, visit our website. 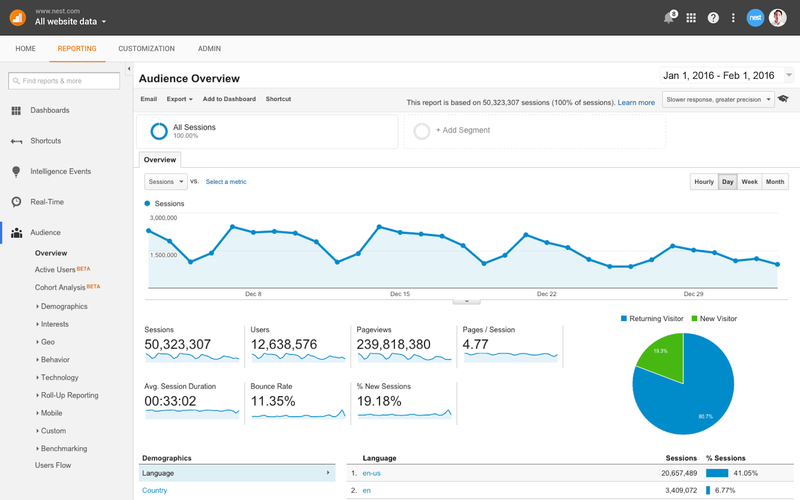 “The Google Analytics 360 Suite gave us the really big ah-­ha moment. When we launched our mobile app, it provided insurance quotes. But after looking at the data, we saw people were attempting to buy insurance. So, we shifted our mobile strategy to offer ecommerce. Google gave us that insight,” - Pawan Divakarla, Analytics Leader at Progressive. Sophisticated marketers who use analytics platforms are three times more likely to outperform their peers in achieving revenue goals. It’s no wonder enterprise-class marketers have been telling us they need more from their marketing analytics tools. Many toolsets can't cope: They're too hard to use, lack sufficient collaboration capabilities, are poorly integrated, and require hard-to-find expertise. “Using the integrations in the Google Analytics 360 Suite, we are able to manage everything in one seamless platform,”- Khoi Truong, Director of Analytics and Media at L'Oréal Canada. Google Audience Center 360 (beta). This powerful data management platform (DMP) helps marketers understand their customers and find more like them across channels, devices, and campaigns. It offers native integration with Google and DoubleClick, plus it's open to third party data providers, DSPs and more. “The Google Analytics 360 Suite has a native integration with DoubleClick — that’s a game-changer. Now I can personalize my media based on website user behaviors, such as what they purchase,” - Khoi Truong, Director of Media and Data Optimization at L’Oreal Canada.